Relaxing by a tranquil pond, listening to the trickle of water and visually drinking the color reflections of lilies is a busy man's dream. Cleaning, fixing, treating, and generally slaving to keep a pond beautiful is a nightmare. The secret to maintenance-free ponds is in developing a healthy, balanced ecosystem that virtually takes care of itself. Each actor in the pond drama plays a role that is complimented by each other player. Always treat new water with toxin-neutralizing products. Filling the pond with water (or even topping it off as it evaporates) introduces dangerous chemicals into the water. Chlorine and Chloramine are toxic to fish and not healthful for plant growth. Some water even contains heavy metals. Always treat new water with toxin-neutralizing products. Encourage the growth of beneficial bacteria to take care of organic wastes. Now that you have clean, toxin-free water, you need to start some beneficial bacteria growing in the pond and in the filter. Anaerobic (oxygen loving) bacteria literally eat and digest organic waste products, turning them into nitrates and fertilizers for plants. Do NOT destroy the biological portion of the filter lest you kill the bacteria you have cultivated Bacteria cling to rocks, stones, fixtures and to your filter media. They need a large surface area over which the water (carrying its pollutants) can pass. Your filter contains a pre-filter pad that traps large particulates and debris (which you should clean frequently). The filter also contains other materials on which the bacteria grow. Do NOT clean this portion of the filter unless absolutely necessary, and never clean it with chlorinated water. That kills the bacteria you have worked so hard to establish. Feed the new bacteria Now that you have introduced bacteria, you must give the bacteria something to eat so that they can "live long and prosper". Begin to add small fish and plants. Watch for and Treat High Ammonia Ammonia "burn" damages fish gills and scales. Several products may be added to the water during the "cycling" process (or any time you suspect high ammonia or stress) to help prevent damage to the fish from ammonia build-up. They are a good maintenance treatment any time you are adding water or otherwise adjusting your pond's water quality. Adjust the pH Adjusting the pH of the water is also important. Pond fish generally thrive in neutral to soft water - water whose pH is at 7. Your test kit will allow you to see the pH. Several products are available for adjusting the pH of the water. Adding Live Plants Fish benefit physically and psychologically from the addition of live plants to their environment. They enjoy the sensation of swimming and hiding among them. They snack on them. They might even devour them like a salad bar. (It may take some trial and error to find the plants that your particular fish will not destroy, but it is worth the effort.) If you want to include live plants in your pond, it is a good idea to get the plants in first so they can establish their roots while the tank is cycling. Choose more robust, heavier-leaved plants instead of delicate ones. The fish go for the roots first, so floating plants don't last long. Floating plants (with roots in the substrate) can provide shade for goldfish ponds. 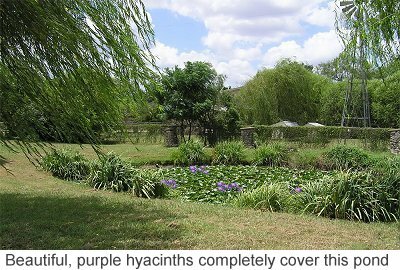 In the case of water hyacinth, the plant grows rapidly and will absorb excess nutrients from the pond, discouraging the growth of unsightly algae. However, be aware! The state of Texas (for one) has declared it illegal to grow water hyacinth as they are considered an invasive species and they WILL take over your entire pond. If the water begins to turn green, algae may be blooming in your new ecosystem. Too much sunlight, too much fertilizer, too few plants. Adjust these factors or add a UV filter to the system. (See our other articles on algae control). As your pond settles into its cycle, it will become more and more stable and care-free. The most important maintenance procedure that should be preformed routinely is cleaning the pre-filter and dragging any debris or sludge from the bottom. Plant materials, leaves, lawn clippings etc blow into a pond over time. Use sludge-removers to speed the decomposition, and manually dredge the pond once or twice a year to remove the majority of the build-up. Add a Pond Skimmer to catch that debris before it turns into a problem. Install a UV Filter to destroy algae if it is becoming a problem. Start by making a list of the goals for your pond. Do you want it to be visible from a window in the house, effectively bringing its tranquillity indoors? Do you want it to be away from the world...an attraction which draws its visitors through your meandering garden to a secluded hide-away? An attraction visible from every corner, or an addition to a patio or barbecue area? Do you want fish in the pond or just plants? Do you want your fish to "winter over" outdoors and do you live in a cold or temperate climate? (You must make your pond deeper for fish in cold climates but can make it more shallow for warmer ones). Do you want a fountain, trickling or spraying? Do you want lilies or open surface? Do you want a regular or irregular shape? Visually survey your property. Make a scaled aerial view map of the area, noting where trees and garden areas already take up space, and then make dotted lines where you intend to build other structures or denoting the adult width of trees already planted or intended. Avoid tree-shaded or potentially tree-shaded areas if you wish to plant lilies in your pond. The lilies will thrive in the direct sunlight and shade the water surface from the UV light which is conducive to algae growth. Trees can provide too much shade and also present a nuisance when they shed their foliage into the pond. Note outlets for water and electricity that are already in place. Are there building restrictions which might affect your plans? Do you know the soil consistency? Draw the pond area to scale on your map, including its shape.